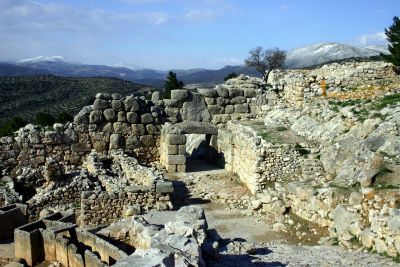 Mycenae is a site located about 56 mi. [90 km. — “as the crow flies”] southeast of Athens in the Peloponnese. There is 9.5 mi. [15 km.] of plain to the south of it until one reaches the sea and it guards passes leading north from the plain into the mountains and on to the Corinth area and from there into mainland Greece. The site is situated on a limestone hill that is surrounded by deep valleys on all sides except the west and these in turn are surrounded by high mountains to the east and north. Most of the existing fortifications of the citadel date from the “Mycenaean Period”—that is from 1600 to 1200 B.C.